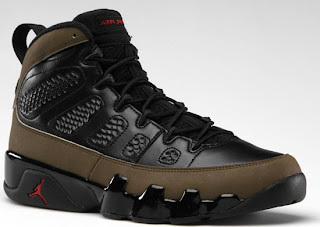 Set to return this weekend, the original "Olive" colorway of the Air Jordan IX. It will mark this colorways second retro release to date. Last seen in 2002 during the Air Jordan 9 Retro's first retro run. It was the second colorway retroed and, was not well received. It sat on store shelves for quite some time, some places marking them down to less than $50. Others even dyed the olive parts black and tried to sell them off that way. Even though that was the case back then, as the years have gone by they have become more sought after. Now, 10 years later, the "Olive" Air Jordan 9 Retro will return. This time around they will be a limited release and, only available in men's sizes. Perhaps a precautionary method by Jordan Brand to help prevent a sales look. These are now, a guaranteed sell out and will be sold out of stores as soon as they put them available for sale. Retail is set at the usual $160. They will be available at select Jordan Brand accounts on Saturday, November 17th. Enjoy the new image below. I've also included an image of my 2002 pair for those who want to compare. Those of you that want to get these now, click here to grab them on eBay.